The most exciting thing about the video, in our opinion, is that both garner new insights from each other while discussing Bill Minns 3d representation of the events. WATCH: Video of Man Presenting His "Fossilized Bigfoot Skull"
May believes his weighty prize — it tips the scales at 70 pounds — is a fossilized Bigfoot skull. What compels him to make such a claim? Because he says he has seen a couple of the nonfossilized, live skulls — attached to their monstrous, hairy bodies — in recent years. The first time was in April of 2011, just before dark one evening. May was “kicked back, enjoying the hot springs” near the mouth of Ogden Canyon when he spotted something emerge from the bushes just across the river. It was black with a silky coat, and it moved quickly, never looking over at May. The only other time May has seen Bigfoot was about a month ago, in the same area. He says he likes to go to the hot springs late at night, when there are fewer people there. He was at the springs about 2 a.m. one night. On this particular night, however, he decided to investigate, thinking perhaps it was an animal. May was walking down the trail when he saw it, down in the trees by the water. How do others respond to May’s Bigfoot tales and his claim of finding a skull? 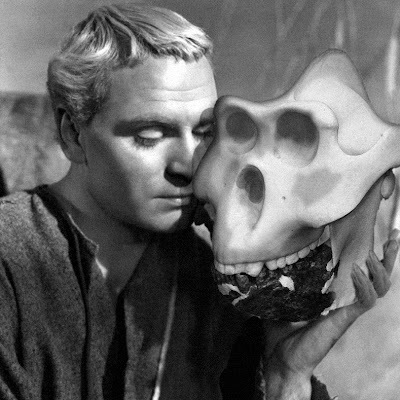 Carpenter said it’s perfectly normal that May saw a face in the rock. Still, Todd May is undeterred. He believes that many people have “tunnel vision” when it comes to discoveries like this. The Rats logo. Rats is an acronym for Remote Aerial Tripod Specialists. An Alberta news source, MetroNews, showcases one of their local businesses involved in the Falcon Project. The company is called Rats Inc.
An interesting tidbit from the archived website is this tidbit about how aerial surveillance of arctic ice flows inspired the co-founder of Rats Inc.
Read a brief history of Rats Inc. and then the article from MetroNews. Stephen [Rats, Inc co-founder] has taken a lifetime of interest and experience in remote controlled aviation to an obvious next level. As a young man, he migrated towards the Ultra-light Aircraft Industry and with a background as an instrumentation machinist, he then managed the development of the Christensen Ultra-light program. This included setting up manufacturing facilities, training of employees and clients. In total, Stephen has produced over 35 fixed-wing aircraft, including a number of antique aircraft restorations. With a desire to train as a Aircraft Maintenance Engineer, he hired on with a company that had acquired a Challenger 601 for the purposes of aerial reconnaissance of ice flows throughout out the Arctic Circle. It was during this 3 year Arctic period that was most influential for Stephen. As it was then ''he derived the concept of Remote Controlled Imagery''. In 1993 Stephen founded a company which was first to introduce R/C Aerial Photography to the public. After a couple of years, clients included everyone from government agencies, corporate firms to private individuals. In 1997 another inventor, Keith Campbell and Stephen formed their present company, Rats Inc. Collectively they've developed their line of products into the company as it now stands. With combined focus, their long term plans have withstood the test of time and as a result, one of the finest products developed within the Canadian Borders. 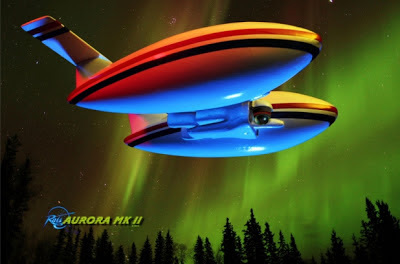 American researchers believe a high-tech airship created by a company located in the Alberta hamlet of Lac La Biche could solve the mystery of the sasquatch once and for all. Utah-based bigfoot researcher William Barnes is trying to raise $300,000 to buy a helium-filled airship that would quietly float over dense North American forests and use thermal-imaging equipment to film footage of the legendary – not to mention elusive – creature. An official fundraising drive for the venture, which has been dubbed The Falcon Project, kicked off last Saturday in Oregon with an all-day symposium. After a personal encounter with bigfoot in 1997 and more than a decade spent researching sasquatch researchers, the project’s founder came up with the idea to use unmanned aerial surveillance to record the fast-moving nocturnal primate. “We don’t want to bother them, we just want to study them,” Barnes said. That’s where Stephen Barkley, the president of Remote Aerial Tripod Specialists Inc. (RATS), fits in. His company in Lac La Biche, a hamlet located 220 kilometres northeast of Edmonton with a population of fewer than 3,000 people, has designed the aircraft to be used for the ambitious aerial undertaking. “If it wasn’t for his (Barkley’s) innovation of this type of airship, this would never work,” Barnes said. In his 15 years of running RATS, a business that provides blimps and airships for outdoor advertising and photography, the entrepreneur said this is one of the most out of the ordinary projects he’s been a part of. While a prototype of the Aurora MK II, the airship that will carry thermal-imaging and high-resolution wireless videography equipment, has been designed, a full-scale model won’t be built until funds are secured. “Being an inventor and an entrepreneur, it would really be a feather in our cap to have the platform out and operating,” Barkley said. The business-owner said he has “done his research on bigfoot” and wants to see what a functioning ship hovering above the forest will be able to capture. “If they do come up with a definitive answer to the whole thing, then, boy, I’d sure have loved to have been part of that,” he said. The team behind the Falcon Project includes Jeff Meldrum, an Idaho State University professor of anatomy and anthropology, who has been probing the primate’s existence for nearly two decades after examining inexplicable footprints in Washington. Founder Barnes, a former gold dredger, is eager to secure funds to purchase Barkley’s hovering invention. He still remembers vividly what he says was a sasquatch encounter in the middle of the night at a campsite in California in 1997. The hairy creature was about three feet away, walking on two feet and “too big to be a bear,” recalled Barnes. As the designer of the Creature of the Black Lagoon, he is an expert in costume design. He has also been a consultant for 3D software design, which requires knowledge of how cameras work in order to duplicate authentic looking rendered results produced by multiple types of cameras and camera settings. Mr.Munns has investigated the PGF footage from multiple angles; lens size, film speed, evidence of splicing and editing, camera distance, and has created the definitive analysis of the film. During today's presentation he explains how he can conclude with confidence, the PGF cottage has not been edited, because splicing, even in second generation copies always leaves evidence of the splicing. Another topic discussed is how small the Sasquatch's head is. When creating costumes, it is an additional process. The Sasquatch in the film would have been a subtractive process. Comparing more modern king kong costumes, Munns illustrates how even more current costume technology can still be problematic regarding seams and hair. It gets really interesting when he talks about breast fluidity. Below is an excerpt from Dr. John Bindernagel's Wikipedia page. John A. Bindernagel (born 1941) is a wildlife biologist who has sought evidence for Bigfoot since 1963. He published a book in 1998 entitled North America's Great Ape: the Sasquatch (ISBN 0-9682887-0-7). Bindernagel grew up in Ontario, attended the University of Guelph, and received a PhD from the University of Wisconsin–Madison. He moved to British Columbia in 1975 largely because the region was a hot spot for Bigfoot sightings. Over the years, he has collected casts of tracks that he believes belongs to Bigfoot. He also claims to have heard the creature near Comox Lake in 1992, comparing its whooping sound to that of a chimpanzee. Bindernagel believes that the Bigfoot phenomena should receive more attention from serious scientists, but has remarked, "The evidence doesn't get scrutinized objectively. We can't bring the evidence to our colleagues because it's perceived as tabloid." Christopher Oliver hand delivered one of the two SquatchIt prototypes that exist in the world to famed creator of cryptomundo.com, Craig Woolheater on Wednesday June 19, 2013 in Arlington, Texas. Woolheater will be attending both the Hopssquatch event as well as the Falcon Project Conference in Oregon June 22-23, 2013. 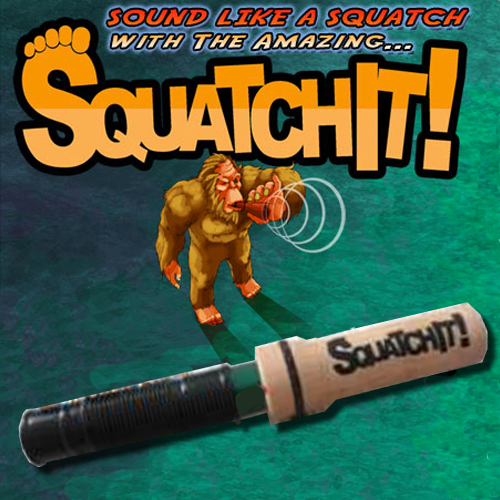 Craig will be introducing SquatchIt, the world’s first Bigfoot Call novelty noisemaker device, to Bigfoot luminaries including Bob Gimlin, Dr. Jeff Meldrum and Cliff Barackman of Finding Bigfoot fame. “We are so excited to have Craig introducing SquatchIt to the some of the most celebrated and influential people in the Bigfoot community. Having Craig as the first ambassador of SquatchIt is a dream come true,” says James Villepigue, co-creator of the SquatchIt Bigfoot call. Craig Woolheater is the creator of CryptoMundo.com, the online web portal dedicated to Cryptozoology, that serves as the epicenter of the online Bigfoot community with articles detailing adventures, treks, theories, and wisdom of some of the most respected leaders in the field. SquatchIt is not only the world's first novelty Bigfoot call aka a “predator call” product, it’s also a new lifestyle brand phrase that allows people to shrug off situations that really aren’t worth getting upset over; i.e., when you’re in a jam, just SquatchIt! For more information about SquatchIt visit their website at squatchit.com or email contact(at)squatchit(dot)com. The Falcon Project Conference will take place at the Bossanova Ballroom 722 East Burnside in Portland, OR on June 22, 2013. GET YOUR TICKETS NOW! The June 23, 2013 Hopssquatch event will take place from 12:30PM to 4PM on Sunday, June 23, 2013, at The Lucky Labrador Beer Hall 1945 Northwest Quimby Street 1945 Northwest Quimby Street and will feature Dr. Jeff Meldrum & William Barnes of the Falcon Project. GET YOUR TICKLET BELOW! Tickets -$5 per person or save money by becoming a member of HopsSquatch for $50. Last chance to buy tickets and reserve your seat for this Sunday's HopsSquatch (June 23rd 2013). 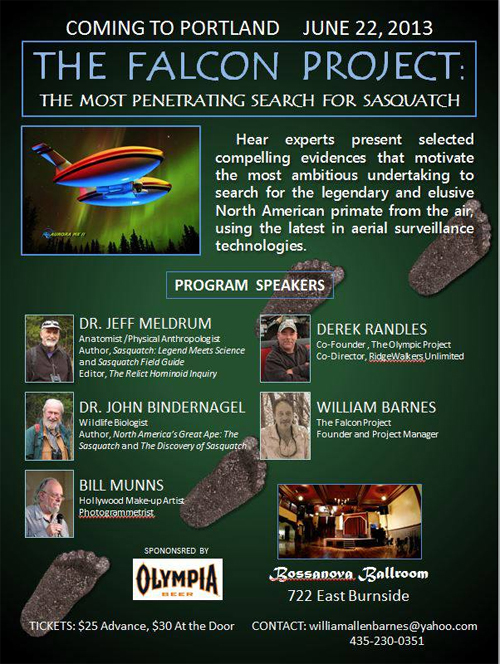 Along with Dr. Jeff Meldrum and William Barnes of the Falcon Project (aerial survelliance technology to find Bigfoot) Derek Randles who is part of the Falcon Project's ground team will also be in attendance. Click the following links to learn more about Derek Randles and the excellent Saquatch expeditions he runs called the Olympic Project Expeditions. 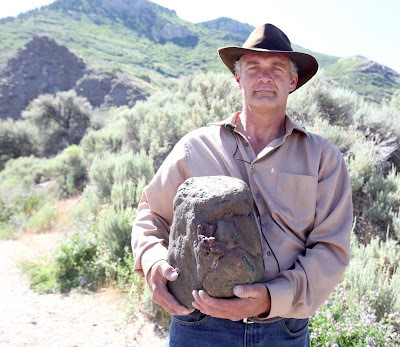 Dr. Jeff Meldrum one of the world’s most respected authorities on Sasquatch and William Barnes the creator of the Falcon Project will join Big Foot enthusiasts at the Lucky Lab NW to share their quest to find Sasquatch, Sunday, June 23, 2013 from 12:30-4:00pm. Learn more about plans to build a remote-controlled dirigible equipped with thermal-imaging and other high definition cameras and send it aloft in hopes of catching an aerial glimpse of Bigfoot. Dr. Jeff Meldrum is a Full Professor of Anatomy and Anthropology with the Department of Anthropology at Idaho State University. He has made multiple appearances on The Discovery Channel and History Channel regarding his Sasquatch Research. He is most noted for the Discovery Channel Documentary and companion book Sasquatch: Legend Meets Science. The blimp-based search - dubbed the Falcon Project - was the brainchild of William Barnes, a Utah man who said he encountered Bigfoot in 1997 in northern California. Barnes said he watched an immense, hairy creature that was otherwise "well-manicured" approach his tent before striding up a rocky ledge. Years later, he approached Meldrum, well known in Bigfoot circles, about his idea for an airship expedition. The two speakers will be followed by a panel discussion involving Dr. Meldrum, William Barnes and Craig Woolheater, founder of the world’s most popular Cryptozoological website, Cryptomundo.com. 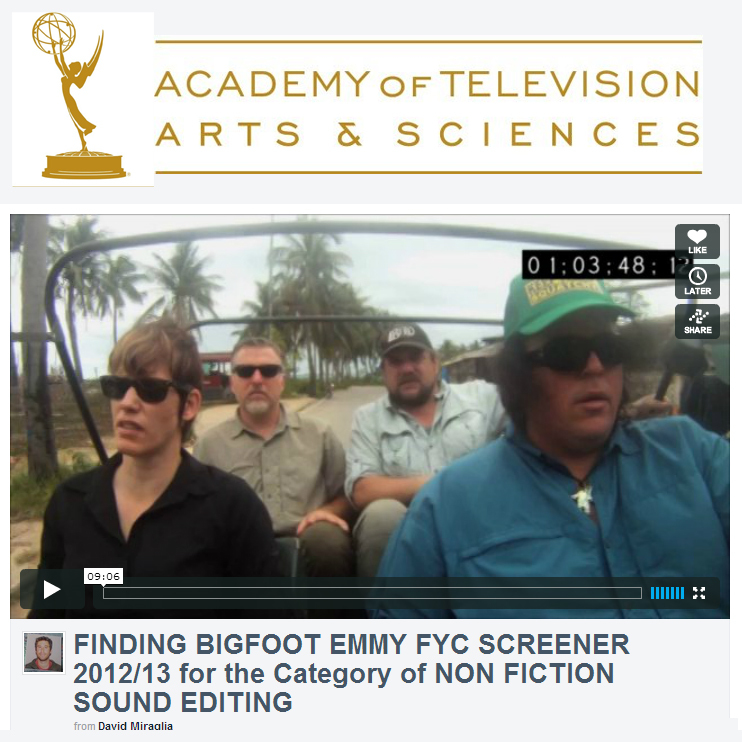 Craig has also contributed to and appeared on History Channel’s Monster Quest and the documentary Southern Fried Bigfoot. 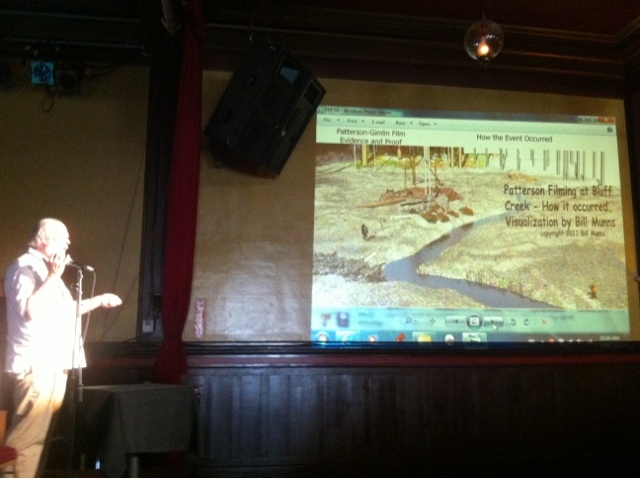 Become Bigfoot insiders learning what is on the horizon of Bigfoot research while having a beer with other Bigfooters at the larger Lucky Labrador NW-1945 Northwest Quimby Street, Portland, OR 97209, on Sunday June 23, 2013. Don’t miss your chance to be a part of this historic event. Limited space available, only $5 per person to attend. This event will be held at the larger Lucky Lab NW in anticipation of a sell-out crowd. Reserve early so you don’t miss out. The times of this presentation have also adjusted to accommodate speakers. HopsSquatch is a unique speaker’s series bringing together Bigfooters and those that want to know, in the relaxed atmosphere of beer and camaraderie. No recent photos of recent Malaysian track find. This Pic is from Cryptomundo circa 2007. A recent sighting of 200 foot prints is causing a stir in Malaysia. The Malaysian Bigfoot is known as the Orang Lenggor or Lenggor Man. In 2006, Tay Teng Hwa, the Johor Wildlife Protection Society secretary, described the creatures as, "between 10 and 12 feet tall while their children were six to seven footers. Seventy per cent of the Orang Lenggor have a human appearance but the rest resemble apes." In a local Malaysian paper, The Star Online, an article describes a man discovering a series of footprints and disturbing villagers. Read the article below. ABOUT 200 Bigfoot-like footprints have been discovered near Kampung Kepis Baru, Kuala Pilah, causing panic among villagers, reported Harian Metro. Adnan Pungut, 48, claimed he discovered the footprints when he was clearing rubbish and wood at his rubber estate at 3pm on Saturday. “I immediately informed the others because I was scared. I told the other villagers and all of us went back to the area. “We found 200 footprints that were about the same size and tried to follow them,” he was quoted as saying. “Based on the footprints, we can assume that the creature has two legs and weighs more than 100kg,” he said. According to Adnan, further checks by villagers found that the creature could be headed towards a nearby forest. The report stated that the villagers decided not to pursue the creature as they were afraid. “We will let the authorities handle it as the animal could be endangered,” Adnan said. For further reading on the Orang Lenggor, there's an extensive article at UFO Digest covering Malaysia's history of sightings. 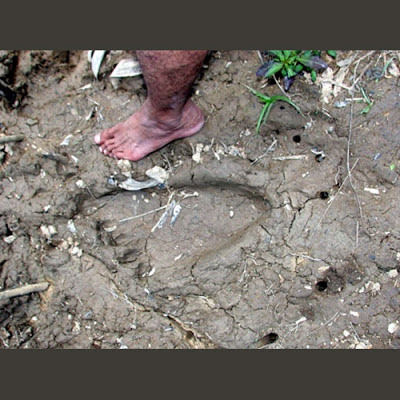 For something slightly more recent you can check out Loren Coleman's 2007 post New Malaysian Bigfoot Tracks! So the theme songs go. It's pretty catching, by the time you watch all the videos it will be stuck in your head. These are a great series. Short and sweet. You can catch the series every Monday at the Bigfoot Roommate YouTube channel or even the official Bigfoot Roommate website. Below you can watch the promo and the first three episodes. The above quote from The Truckers Report was somewhat in jest and was a response to a conversation thread started by a trucker who was asking if other truckers have witnessed Bigfoot while driving. In fact, he asks what his chances of shooting a Sasquatch are and asks, "Have any of you seen a skunk ape / rock ape / sasquatch / yeti / bigfoot? What do you think my chances are of bagging one these creatures for the long haul home?" As you can imagine some of the other responses were also less than serious. Another reply was, "First you have to put in your magical 1 year. Then you'll learn the super secret handshake and take the sacred trucker oath. Then and only then you will receive super secret maps of all the super secret places that only WE know. On page 23 of the aforementioned maps you'll find the exact location of Bigfoot, with descriptions on what to use as bait." All joking aside, some of the most interesting sightings have been witnessed by truckers. A quick search on John Green's Sasquatch Database reveals over a dozen reports. We count down the top ten below. 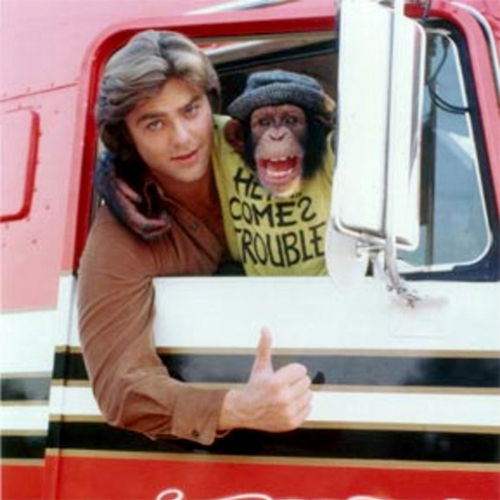 Unnamed truck driver was driving over a field mear [sic] Dever-Conser (only Dever is on map) when what appeared to be a huge shaggy white gorilla came running alongside the cab and peered in the window at him. As the truck neared a mint distillery the creature turned and disappeared in nearby woods. Truck driver on Rte 32 just outside Sykesville saw a large object by the road. As he approached it stood up. Appeared to be a 7 to 8-foot ape, caked with mud from the waist down. Truck driver said only that he saw a "hulking creature" climb from the Ohio River onto the shore, "I can't describe it. I've never seen anything like it before." However later that night across the river in Kentucky there was a description of a "huge man-like thing." All reports in rural West Des Moines, at or near Raccoon River. About 4 a.m. Larry W. heard screams from alfalfa field, dogs upset, went outside and heard woof sound that scared him. Went in and from second floor window saw heavy creature, taller than 6'4" clothesline poles, walk ain front of yard light and down the driveway. Arms swinging head high, walked with fluid grace. Called sheriff, and they found tracks in frost 48" apart. One soft spot at gopher hole showed front part of big human foot. A few days later, according to Russ D., there was a report on the news of a truck driver seeing a similar creature in his headlights on the I-80 near the river. Doug Sipes, camping out with friends, burst into house saying Bigfoot had scared them. A tall, hairy, manlike creature had appeared at their fire "and ran them off." Next day Sue Johnson saw the camp torn up, stuff scattered and torn, strange footprints in dirt. Footprints not described. Between Estill and Hampton, near the Salkehatchie River. A week later there was a story in the Hampton County Guardian saying that a truck driver had reported an emergency stop to avoid hitting a sasquatch on the road. The creature was said to have either banged on the door or jumped onto the hood. Harold Westlund, Chico, stated that Joe Ely, fire control officer in Menticino National Forest, had investigated an incident where a logging truck driver arriving at the loading area noticed that a 50 gallon drum had been tossed around. He fled, but large humanlike footprints were later found there. Truck driver radioed on CB to truck behind him saying there was some kind of hairy ape in the bush by the road. Driver behind saw it too, said was about 8 feet tall, very heavy looking, very hairy. Location just "near Helena." No information on time of day. R, 37, a truck driver, and D, 233, truck dispatcher, driving North on Hwy 97, in an 18-wheeler, encountered an 8 ft. biped covered with shaggy, brownish-grey hair, walking south in the northbound lane, on the east side of the road. They had heard about it on CB radio a quarter hour earlier, and saw cars in front of them veer around it, so they slowed to 5 miles an hour as they went by, and D made eye contact. Estimated weight 400 t0 500 pounds. It had unbelievably long arms, a longer, taller head than a human, and turned its whole body, not its neck. It appeared calm but possibly confused. Truck driver reported to sheriff's office that he was sleeping in the cab of his truck north of Brooksville when a hairy creature yanked him out and ripped his clothing. Ramona Hibner confirmed that the incident was reported and that the driver was at Lykes Memorial Hospital and was scratched. We picked the Florida incident as number one because not only did the truck Driver get his clothes ripped off, but he was hospitalized! On top of all of that there was a second witness who confirmed the incident! Does a real estate website know where Bigfoot should live? 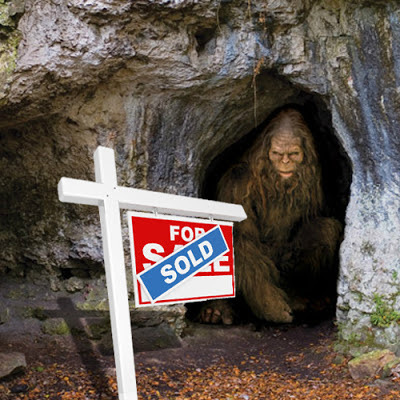 In a Q13Fox article titled, "Website claims Bigfoot is a Washingtonian," Mariana Hicks reports how a Real Estate blog names Washington as No. 1 “Best State for Bigfoot to Live in"
Read Mariana's overview below followed by the 11 best and 5 worst states for Sasquatch to live in determined by estately.com. SEATTLE – Washington was named the No. 1 “Best State for Bigfoot to Live in,” according to Estately.com, with more than 500 reported sightings of the mythical beast. Estately reported Washington’s heavily forested area gives the big guy lots of places to roam. The state has the fifth most designated wilderness acreage in the country. 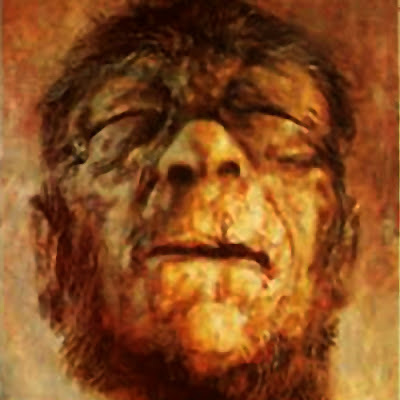 Whether or not you believe in Bifgoot, Washingtonians love the monstrous mammal — Skamania County even a law forbidding hunting Bigfoot, there’s a music festival named for him and even a publishing company. Unfortunately, there is a downside for Bigfoot hiding out in the Evergreen State. There have been two dozen reports of people shooting him but Olympia Beer wants him alive and is offering a $1 million reward for his safe capture. Estately drew its conclusion based on findings that included wilderness and forest cover, protective laws, likelihood of road kill, Bigfoot enthusiasm and number of sightings. Trailing Washington, California took second place as a potential home for Bigfoot. Estately took points away for high population density, bounties, laws allowing people to hunt Bigfoot and the number of claims from people who said they had shot him. Now for the top 11 States and 5 worst states for Sasquatch to live in. Points were given for wilderness area and forest cover, protective laws, likelihood of deer roadkill (a favorite food), Bigfoot enthusiasm by locals, and frequency of sightings. Points were taken away for high population density, local bounties, laws allowing hunting of Bigfoot, and the number of reports of locals claiming to have shot one. In the end, Estately determined these 11 states provided the best habitat for Bigfoot to hide out and make occasional appearances in grainy photos and videos. According to the Bigfoot Field Reseachers Organization (BFRO), the Evergreen State has far and away the most “credible sightings” of any other state with 537. It really is the best state for Bigfoot to see and be seen. Heavily forested and with the fifth most designated wilderness acreage in the country, Washington State provides exceptional habitat and a Bigfoot-positive culture. The only downside is it also has the most reported Bigfoot shootings with 24, and locally-produced Olympia Beer is offering a $1 million reward for the safe capture of Bigfoot. Despite the threat of murder and kidnapping, Washington is the only state with a law on the books forbidding the hunting of Bigfoot (in Skamania County), and the state is home to the Sasquatch Music Festival, independent publisher Sasquatch Books, and it was the location for the classic Bigfoot film Harry and the Hendersons. It even used the Sasquatch as the mascot for its now vanished NBA team—the Seattle SuperSonics. With over 428 sightings, California has the second highest number in the United States. The state has over 15 million acres of designated wilderness, as well as Bigfoot museums in Felton and Willow Creek. There are numerous organized groups searching high and low for them, including North America Bigfoot Search and Southern California Amateur Bigfooters (SCAB). The species is honored in the names of dozens of California businesses, including The Bigfoot Lodge in Los Angeles and San Francisco. Truth be told, California gets the #2 slot because when Bigfoot finally comes out of the woods to reveal its existence, it’s going to want to hire an agent, purchase some laser hair removal, and take its talents to Hollywood. 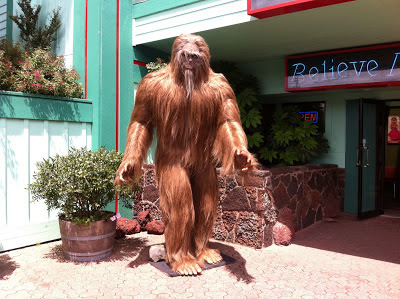 Oregon is the unfortunate home to the world’s only Bigfoot trap in the Siskiyou National Forest, but the state still exhibits the many features this hairy being craves. There is plenty of fog and dark forests to hide in, plus there’s over 2 million acres of wilderness and a hippie vibe that’s tolerant of infrequent bathing. The Sasquatch Brewing Company honors the beast with its Hairy Knuckles Stout, and there’s even a festival called the Sasquatch Brew Fest. Also, Bigfoot traditionally takes his water unflouridated [sic], just like Portland, Oregon does. Being a bashful Bigfoot makes dating hard, especially for any Bigfoot longing to meet eligible humans. Luckily, Ohio’s residents take an unusually enthusiastic interest in the legend of Sasquatch, who’s been spotted in Ohio 234 times—more than all but three other states. The state hosts the annual Ohio Bigfoot Festival and the Ohio Bigfoot Conference, and there are numerous groups of squatch hunters in the state. Everything’s bigger in Texas so Bigfoot should feel right at home in the Lone Star State. Still, the hairy one should be on the lookout for hunters because it’s completely legal to plug a Sasquatch in Texas, provided it’s on private property and with permission of the owner. Also, Texas is home to the dreaded Chupacabra so it’s possible they battle over territory. While local Bigfoot enthusiasts gather for the Texas Bigfoot Conference, Sasquatch can wander the Sam Houston National Forest and feast on the exotic wildlife stocked at neighboring hunting ranches. It’s nice to add some antelope and ibex to the standard diet of deer and berries. With a small human population, plenty of wilderness, and millions of acres of rugged forest, Idaho is the kind of place even Bigfoot could get lost in. The only downside is the state is crawling with skilled hunters who have a keen eye for wildlife. Also, there’s an Idaho State University professor cooking up a plan to utilize drones with thermal imaging equipment to spot Sasquatch from the sky. Hard to find privacy. Tennessee gets the nod over neighboring Kentucky because Bigfoot is still angry over Daniel Boone’s claim that he shot the first Sasquatch in the Bluegrass State. Also, nearly 58% of Tennessee is forested, and there are over 9,000 cozy caves to live in, the most in the country. As a special treat, Tennessee is home to 15 varieties of turtles, a healthy Bigfoot snack that’s both crunchy on the outside and chewy in the middle. According to BFRO, Michigan has 173 sightings—8th most in the nation. 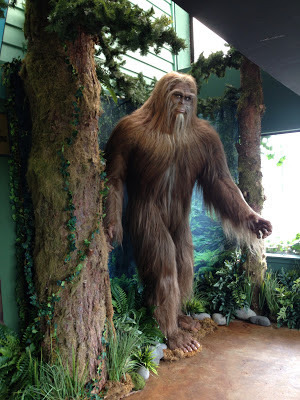 There are various local groups who study the elusive bipeds, including the Michigan Bigfoot Information Center and Michigan Bigfoot. Most importantly, Michigan is a culinary wonderland for ol’ Bigfoot thanks to extensive apple orchards and the fifth highest frequency of roadkill deer. Plus, with nearly 13,000 state parks there are excellent opportunities to steal picnic baskets from campers. Many Bigfoot sightings include witnessing the creature stealing apples, snatching deer carcasses off the road, and raiding campsites. As if that’s not enough food, there’s a local woman who claims to feed blueberry bagels to the numerous Bigfoot who live in the woods behind her house. Pennsylvania tends to shoot first and ask questions later when they come in contact with a Bigfoot, but perhaps that’s because the fuzzy rascal is allegedly prone to vandalizing RVs? All the same, the Keystone State is 66% forested habitat, with Bigfoot sightings frequently occurring in the Michaux State Forest. The state also has an enthusiastic fan club in the Pennsylvania Bigfoot Society. Pennsylvania is also home to the Houdini Museum, and surely Bigfoot is an admirer of the late performer’s skill in escaping. While the rest of the country bad mouths Bigfoot’s horrible stench (like a skunk + rotten cabbage), North Carolina’s hill people speak lovingly of its “beautiful hair.”Besides this welcome praise, the rugged terrain of the Great Smokies and Blue Ridge Mountains provide ideal habitat, and the warmer climate provides ideal weather for mating season, apparently March through April. Many in North Carolina, such as Carolina Bigfoot Field Research, are working diligently to protect these allegedly non-existent creatures. West Virginia is the #1 state for roadkill deer, providing a virtual roadside buffet for the hungry Bigfoot. And to wash it down, moonshiner shacks still dot the hills so Sasquatch can sneak a little swig now and then. In addition, 81% of the mountainous state is forested, it’s sparsely populated, and there are plenty of caves—ideal for a reclusive Bigfoot. However, the West Virginia Bigfoot Research Organization is fast on their over-sized heels, frequently searching the region for the elusive Sasquatch. 46. New Jersey: Share the woods with the Jersey Devil? No way. 47. North Dakota: Nowhere to hide in a state that’s only 2.6% forested. 48. Louisiana: Humidity wreaks havoc on hair so just imagine if your entire body was covered in it. 49. Hawaii: It would be awful lonely living in state devoid of any other Bigfoot. 50. Florida: Around these parts, Bigfoot gets called a Skunk Ape, which is unflattering. Also, Florida has the fifth highest recorded incidents of people shooting a Bigfoot. And there’s a Florida-based online store selling fake Bigfoot urine in glass specimen bottles. Experts will present compelling evidences that motivate the most ambitious undertaking to search for the legendary and elusive North American primate from the air, using the latest in aerial surveillance technology. An all-day symposium event to kick-off fundraising for the THE FALCON PROJECT – The most penetrating search for the legendary sasquatch ever undertaken, will take place June 22, 2013 in Portland OR. Hosted by Olympia Beer, in the Bossanova Ballroom, the symposium will feature multimedia presentations, panel discussions and exhibits. (http://www.bossanovaballroom.com/event-details/?The-Falcon-Project-72-Portland). The former permits approach and observation with minimal or no disturbance of the subject’s natural behavior. The latter is critical for surveying in areas of dense stands of forest where a sustained vertical perspective is essential for locating animals on the forest floor. The unmanned 45′ dual airship is equipped with a proprietary propulsion system that can carry the airship at speeds of 35-45 mph and maneuver with the degree of precision necessary to track a fast-moving animal. The construction, instrument integration, and flight training is being provided by Remote Aerial Tripods Inc. of Canada, (www.ratsinc.net) with Stephen Barkley as lead designer of the Aurora Mk II. The airship, gyro-stabilized camera mount, and ground operations equipment have been designed specifically for the requirements of this task. The sleek, quiet, never-before-used technology eliminates the noise produced by conventional aircraft and on the ground investigators, allowing stealthy approach to wary reclusive species. The challenge of locating a solitary, nocturnal far-ranging, intelligent primate is demonstrated by the dearth of definitive photographic evidence. The Falcon Project offers a novel approach employing the latest technologies. William Barnes (williamallenbarnes@yahoo.com; 435-230-0351) is the project founder and manager, with over 25 years experience operating his own businesses, including gold dredging and marketing. Barnes had an encounter with a sasquatch in 1997, and is motivated by the challenge of bringing definitive image evidence before the scientific community for the purpose of finally resolving the mystery of sasquatch. 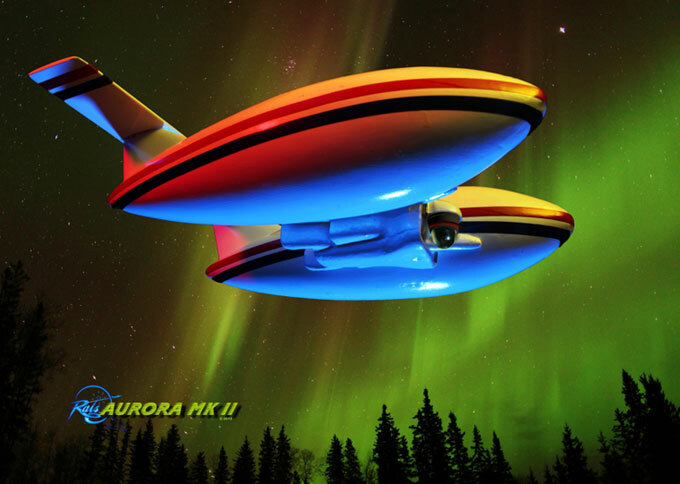 The Aurora will be deployed in selected areas of appropriate habitat where reports suggest sasquatch may range. The specifically built gyro-stabilized camera mount will house state of the art equipment that can view and film in infrared, thermal imaging and High Definition. The camera is the highest resolution (1024 x 768 pixel) uncooled, long wave 7-14 um and 17 micron pixel pitch system in the world today, except for classified U.S. military equipment. Peak emittance from the human body is around 10 um and so this camera will provide the best possible resolution. ICI IR Flash software used with the camera allows image enhancement to 12 Mega Pixels which is better than any uncooled thermal imaging camera in existence today. In other words you will be able to literally print a 12 Mega Pixel image with a Thermal/Infrared Camera by using the proprietary ICI IR Flash Software. This is unheard of in the entire infrared camera manufacturing industry. The FOV (Field Of View) lens used will be a 44 mm x 176 mm optic, f 1.2. To our knowledge no company has used a telephoto lens of this size with an uncooled 1024 x 768 camera for such a project other than possibly the U.S. Defense. Putting an optic on this particular camera will be a first for ICI as it is the newest uncooled IR camera on the market today and not even offered to the public at this time. Funding and tax deductible donations for ongoing operations of the Falcon Project will be handled through the ISU Foundation, to the attention of Janet Schubert, Development Officer for the College of Science and Engineering. For further information contact Dr. Meldrum (meldd@isu.edu; 208-282-4379). In addition to Meldrum and Barnes, speakers will include Dr. John Bindernagel and Bill Munns. 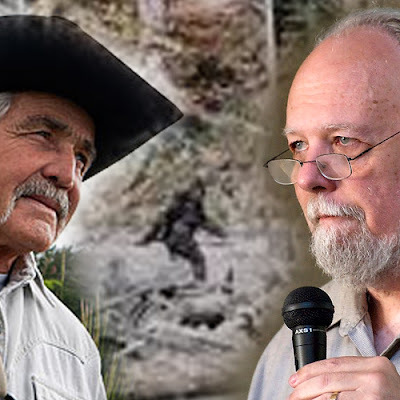 Special guest will be Bob Gimlin, witness to the famous Patterson-Gimlin film of a Bigfoot in northern California in 1967. For advance ticket sales ($25 advance / $30 at the door) to the upcoming Portland event go to http://www.bossanovaballroom.com/event-details/?The-Falcon-Project-72-Portland. For details on the June 23rd follow-up event hosted by Bigfoot Lunch Club please click on the following link. 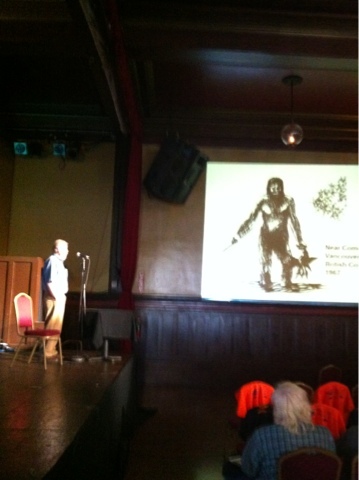 June 23rd HopsSquatch with Dr. Jeff Meldrum.